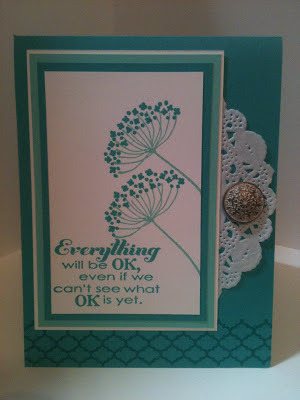 This card is what we will be making during the June 9th class using the Stamp-A-Ma-Jig. I just love the combination of Bermuda Bay and Coastal Cabana together. YOU can start ordering these colors on Friday at noon! I decided to add a doily into the mix with one of the Antique Brads. I think it adds the perfect touch! I used the tone of tone of the same ink with the pattern at the bottom. I am just in love with this card! Do you love that sentiment? Everything will be okay, even if we can't see what OK is yet. :) It's quite the true story. That sentiment is from the new Really Good Greetings stamp set. I definitely think it is "really good". 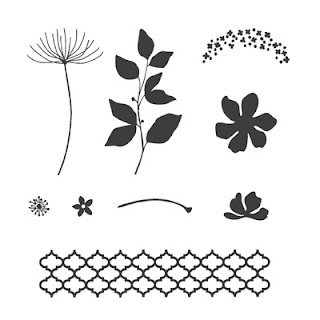 Here are the images in the Summer Silhouettes stamp set if you wanted to see them! They are perfect for the upcoming summer months! Let me know if you have any questions! I am happy to assist you in your stamping adventures!